When I write about some ingredients or vegetables, I am usually quite confident that most people will like them. Lotus root for example may look exotic to western eyes, but is are quite neutral in taste. Taro root, or satoimo （里芋）in Japanese, are a different matter though, because it has a texture that divides people sharply into like and dislike: sliminess. Japanese people in general, unlike most peoples of the western hemisphere, love foods with slimy textures. Whereas in the American South okra is battered and coated and deep-fried to minimize the slime as much as possible, in Japan the sliminess is even enhanced and celebrated in many okra dishes. Taro root is not as aggressively slimy as okra innards, but it definitely is rather slippery. (It's the base ingredient in the Hawaiian speciality poi.) In Japan taro root is most often boiled or stewed in liquid, which dissipates the sliminess somewhat. It may however take some getting used to. On the other hand, taro root is high in fiber, lower in calories by weight than white potatoes, and very filling. It's a good alternative starch. Incidentally, the Japanese word for taro root, satoimo （里芋）means "potato (or starch root) of the homeland (sato)". 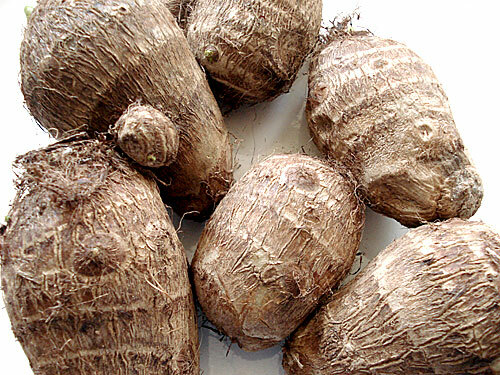 Taro root looks rather hairy and intimidating, sort of like Hell's Angel versions of potatoes. You will usually need to scrub them fairly well - a stiff vegetable brush does this job the best, or a tawashi if you're in Japan - because little bits of dirt tend to get trapped in the hairy bits. Wash and dry the taro roots. Put on a plate and cover loosely with plastic wrap. Microwave on HIGH for 4-5 minutes if the taro roots are small or about the size of golf balls, longer if they are bigger. Peel each root while holding it in a paper towel or kitchen towel, since they'll be hot. The root inside will firm but cooked through more or less. You can then put them into soups, stews, etc. The itchy substance goes away once the roots are cooked. This is an extremely simple dish where the taro roots are cooked in a miso sauce, with crumbled tofu. Actually I originally wanted the tofu to stay in neat squares, but it goes crumbled during cooking. It tastes good (if you like taro root's texture) in any case. Cut the taro root into bite-size pieces if necessary - for small ones just cut in half. Put into a pan with the dashi stock, sugar or maple syrup. Crumble in the tofu. Bring to a boil and cook down until the liquid is almost gone. Add the soy sauce. Thin out the miso with a little water or dashi until liquid rather than a paste, and add to the pan. Let simmer for a few minutes. Serve hot or cold. Garnish with something green to perk up the beige. You can add taro root to stews, soups, and so on. You can also try making taro root chips. They are very nice in a Japanese style curry, instead of white potatoes. Okra - even raw! Usually boiled or deep-fried though. Nagaimo and yamaimo - root vegetables that are slimy when raw. Often eaten grated and raw, with a raw egg for more slimy goodness. Moroheiya, a tropical green vegetable, touted in recent years for its health benefits. Submitted by maki on 2008-05-09 17:17. I, like most Westerners am not a big fan of sliminess (I actually like the smell of natto, but prefer the similar but non-slimy tempeh), but I found taro can have a delicious creamy texture when cooked lightly like one would sunflower chokes. For example, I used it in yellow curry. Thanks for the info; are elephant ears (US) taro, or do they just look similar? Are any other parts of the taro used as food? As far as slimy food, nopales (cactus pads from the 'prickly pear' cactus) are pretty slimy. Have they caught on with Japanese folks? I sliced, breaded, and deep fried a pad, but hubby was pretty squicked out by it (I didn't soak it). I don't think cactus has caught on in a big way yet in Japan (though it seems to be available in some parts). Wikipedia says that elephant ears are taro...depends on how much you can trust Wikipedia in such matters I guess! We never ate taro leaves in the Tokyo/Saitama area where I gre w up, but I guess they are eaten elsewhere. I'd be better off buying taro bulbs from the Asian market to plant. They seem cheaper than 'ornamental elephant ears' at the nursery, plus I'd know they came from an actual food source. I like having decorative food alternatives growing in my yard, especially if they're pretty like taro. We in India, do eat the leaf of Taro (Aravi) it makes yummy snack by putting a layer of Gram flour paste in between (the leaves)and then deep fry!! Its gets crispy and spices add flavor to it. I didn't know that about the slimy foods. I've seen taro in stores here, but don't think I've ever tasted it. Sounds interesting and healthful though. I Luvs Me My Taro! I grew up on Okinawa where my grandmother grew a whole field of them. The typical Okinawan style is to first boil them, peel, cut each into about 6 pieces and cook on medium low heat with Okinawan black sugar (malvado), chunks of ginger and a sprinkle of water until the potatoes start breaking up on the edges. It is eaten warm or at room temperature. The leaves are also eaten. They are really slimy! I love slime! My grandmother used to grow taro. In the village where she was from, it was tradional not only to eat the taro root, but also the leaves and stalks of the plant, stewed. Less slimy than mountain yam? My grand parents were from Hilo , they grew rows of this stuff......my grandmother made poi on special occasions. My mother would fix it other ways first she would peel the root then boil it until it was soft. After it cooled she would slice it in flat pieces about 1/2 to 3/4 thick then fry it in bacon grease..I like it but like anything else you have to aquire tatses for certain things. I adore this satoimo taro. This is an crucial ingredient in my grandmother's 'umani' which I understand from her is 'a more elaborate nishime.' I don't recall calling it satoimo though, I think we have a local-Japanese name for this. I was reviewing your list of other delightful slippery foods and it made me remember something I was reading about years ago. In a Buddhist vegetarian cookbook I came across something called 'junsai.' They described it as a sort of lily bud grown in ancient Kyoto ponds. I think this is another sort of slippery food but never had a chance to taste it as I can't find it here. curious if you have any suggestions for japanese a few specific pickle recipes? I'm particularly fond of the yellow pickled radish, and the purple pickled cucumbers. I'm pretty sure the purple cucumbers have ume and shiso in them, as they taste of ume-shiso to me. I make plenty of traditional american and german pickles and fermented veggies, I'd love to be able to make these at home. You seem like the best resource I know of to find out about making these. These look like what we get here in the UK called eddoes (Available at tesco), which when I looked up are related to taro. I've tried them and thought they were really nice - kind of like chestnuts in flavor but potato in texture. I never found a recipe to use them in except in stuffing so thanks for this - I'll let you know how it turns out. I read somewhere that some japanese people used to eat different imos instead of rice, and that(especially in some rural areas)some people still use it as an alternative. Timely post, what with the US's rice shortage and all. The way my mom used to make it, she would just steam them in the rice cooker. Once cooked, we would just dipped them into sugar and eat them as a dessert. The slime really helps catch the sugar! They're delicious as a dessert - creamy and soft. My grandfather grew a bunch of this stuff - my dad has since picked up the reins and ran with it. Samoans usually peel and cut it in manageable pieces, then boil it in coconut milk and onions. (It varies, of course) Nine times out of ten, I've always seen it in the same pot with green bananas. It's more or less treated as the starchy part of the meal. In Hawaii, we call this araimo and put it in our nishime. I plant Hawaiian kalo in my garden and when it's young it looks like araimo but takes much longer to cook. Be careful with elephant ears. We call them ape and consider them inedible because of the high concentration of oxalic acid crystals that cause itchiness. I don't think that cooking will break those down. Today I had natto with chazuke and takuan for lunch. Yum, yum! All I needed was some okra to complete the meal! Thanks so much for the picture of the raw taro root! I moved to Japan in September, and I have been wondering what those little guys were. Same for the lotus root. junsai i cannot find it in the japanese stores i looked on the internet do you know? where i can order this on line? I have no idea where to get it, but googling around it seems it is called 'edible water shield' in English, and the latin/botanical name is Brasenia schreberi J. F. Gmelin. Hi maki, I have a question. I finally bought taro today, I've been meaning to try it for a while. However, I noticed a weird feeling in my hand after picking one up, not itchy, but kind of numb, from just the outside of the thing. I do have really sensitive skin, but is that normal? It made me a bit nervous. Taro is not slimy when it's cooked. It's slimy when you peel it only. I peel it and boil it in salted water, then eat it with butter. Yum! I also make mashed taro like you would make mashed potatoes. You can also put it chicken soup or make cream of taro soup with chicken stock, onion, garlic, salt and pepper, put in in the blender and add some mozzarella or any melting cheese for a very comforting soup. I love taro and don't think its slimy at all! I was born in Cuba where taro-like roots such as ñame or guagui were popular and I was quite thrilled when I moved to Hawaii to find taro was so much like both those roots of my childhood. Just returned from Cuba where I fell in love with taro root. Wish I knew exactly how they made it. Seems like it was boiled like potatoes but had a hint of garlic and possibly oil or butter over it. I had seconds and then thirds.... Any suggestions for cooking it that way would be appreciated. How do you prepare taro for bubble tea? Can you even use fresh taro for this? I bought one for the first time. not sure what I will do with it .. I bought mine at Albertsons store in the section where the fresh veggies are. I like to buy the small taro root. The large ones are denser, I think. Boil them in water (with the skins on) until they are tender. Drain and run under cool water. Let cool in the refrigerator. Peel and dip into sugar and eat. It's very simple, tasty, fast, and filling. You have to dip after each bite. I live in Hawaii and have started to grow my own taro. I harvested a couple of plants last week, scrubbed, peeled, chopped, and steamed them. Then added a little olive oil and salt. They were so creamy with a very light taro flavor. Delicious and not slimy at all. Thanks for the recipe! You mention Mirin in the recipe. Please, how much is to be used, circa? Mirin is not needed....that was a leftover from a previous incarnation of that recipe. If you do add it just add a splash (say a tablespoon). I see Taro at the Navy Commissary all the time and finally decided to learn how to cook it. Your website has been very helpful. I don't look for "slime" but find when when eating, I don't notice it...as in using nopales with summer squash and onions when I do the Cinco de Mayo party for a local group. Thanks. I'll buy taro on Friday when I shop again and try cooking it before peeling. I lived in Japan for most of the 1960s and have a Japanese wife. I love taro simmered in a simple dashi and eat it often. It is a diabetic friendly starch because of its relatively low glycemic index. Also I am a southerner and celebrate the sliminess of okra. Boiled is so much tastier than fried, and healthier! I eat at Tai Tung Restaurant in Seattle-they often have little fried taro 'cakes' which are really good; I want to cook them. I believe I have read that taro has poison in it. Maybe that is why some people have a reaction. These posts and replies have helped me a lot. I must come back to this website often! Hi Maki and fans - thanks for all the info. Two quick comments (mostly for people growing it). Roots - satoimo roots are "daughter" cormlets that grow off of the main corm in the fall. They are still dormant, and have no "needles" until they start growing leaves the next spring. (So they can be cooked the way you say, no need for serious heat, handled with bare hands, etc. The main corm is like regular taro and has needles and needs much more cooking to get rid of the itch.) Satoimo (araimo in Hawaii) roots can be planted in a garden and grow just fine. Leaves - satoimo leaves are delicious, as good as the very very best Hawaiian luau leaves. Cooking is a little tricky because of the needles. Salt will help neutralize them. Cooking in a pressure cooker for about 25 min, with a cup of water, will do it. Extra good with coconut milk and a few tomatoes. I just wanted everyone to know, that today I had to peel taro root (not knowing it can cause itching) I did so under running water and after about the 9th taro, my hands started to itch so incredibly badly I could not bare it. I highly suggest wearing gloves when you deal with these It's not worth the risk. I do state in the article that the sliminess of taro root can cause itching. Try the pre-cooking before peeling method to see if that works better. I grew up in a household with Cuban parents and grandparents from Spain. My grandmother would cook taro regularly in two ways. She would make a cream soup out of it by pealing them and thinly slicing the taro, boiling them in chicken stock or milk and butter, and adding a little salt. She would puree it once soft. It is very southing for the stomach. My favorite way is making fritters out of them. Pealed and finely grated, a little salt, and spoon droping them into hot oil. They called Taro - Malanga. Almost always available in Cuban markets. Your site is very informative, I am so glad to find it! We are relocating from Oregon to The Big Island of Hawaii later this year and I am very interested in the traditional/native preparation of the local foods. I can't wait to try making and eating poi. I really like trying new stuff anyway. Thanks for the great information. I love Tao Root. Wash in running water using a brush, boil, put in cool water . Peel and grate. Add green onions, a small amount of ground carrots (for color) fry adding salt and pepper. You can put your own taste in them with spice. "Whereas in the American South okra is battered and coated and deep-fried to minimize the slime as much as possible..."
In the South, the indigenous African-American population eats okra (we call it gombo) as is, without frying it in most cases. In the rare cases that we do fry it, it represents an exception, and definitely not the rule. We usually eat okra in stews we call gombo. Whites in the south tend to fry okra, because okra is not native to their diet, but a food they adopted from the indigenous African-American population who also introduced deep-frying to the White population. Because it minimized the "slime factor", whites preferred their okra deep-fried. So the idea of people in the south preferring the okra battered and fried is somewhat false. You're referring to a specific group who adopted the okra from the indigenous African-American population. Taro was eaten in the South as well by the indigenous African-American population, and it was also widely-cultivated as a crop. But a mass hurricane in I believe the early 1900s wiped out the crops. My grandmother knew Taro well, but I did not. So when I saw it in a store, I jumped at the chance to purchase it. I'll incorporate it into my stews, hopefully. I wrote this article years ago, but I just brought up the deep fried okra as an example of an okra dish where the slime is minimized. And actually doesn't the sliminess in okra dissipate and just add to the thickening of the gumbo? That's been the case in any gumbo I've had. (And FWIW, I love gumbo.) Taro root also loses most of its sliminess when cooked in stews and such. See this for what I mean by very slimy food. The okra in the dish is just blanched briefly, so all the clear slime is still there. Just awesome instructions! Surely will try to cook by myself this time. I realised that one of the most appealing points in Japanese cuisine is the sliminess, at least for me. I am going to make some satoimo today, plus sake-kasu marinaded white fish and miso soup, kimuchi and some shiso infused shoyu. Cannot wait. You can also find "taro" at Portuguese specialty shops, but in Portuguese we call them "inhames." I'm not sure how expensive they are because I've never had to buy them. My grandmother, and father in law grow them. Also, be sure to never eat raw taro since some claim a certain dosage of it can make you sick. I am from originally from Santa Maria, Acores (currently in Canada), I find inhames (or taro) at a local grocer for a reasonable price. My grandparents grow these every year, I love them when they are freshly boiled with some sugar on top! My mom would also mash them into a sweet paste and put it on top of bread for me and my brother when we were young. About how long does taro root last? I've had it for quite a few weeks and never got around to making it... I also had it in the fridge, just found out I wasn't supposed to store it that way! Oh well. Do you know how to tell if it has gone bad? Cooking taro root have been made great by this article. The recipe has really impressed me. Even though the cleaning process is a bit time consuming, I would love to try this recipe at home. Thanks a lot for sharing this recipe with us.